Madness is truly measured by the mile on a long-distance eco-drive challenge. This one, like most, started out normally enough, mainly as a matter of intrigue to see whether it’d be possible to do that distance on a single tank of fuel, in a ‘let’s see if we can make it there’ manner. By the time the end came twenty three hours later, it had pretty much degenerated into a zany competition, at times involving some of the slowest driving ever seen on public roads, all to see who could be the most frugal about it. You can probably see where this is all getting at, and for that, a previous challenge is to blame. The seeds were planted for this one in December last year – it was at the preview of the Mercedes-Benz E 300 BlueTEC Hybrid that someone from the press corps suggested to Mercedes-Benz Malaysia (MBM) that we attempt to replicate the Africa-UK challenge undertaken by the car back in June. Then, Brit motoring hack Andrew Frankel – together with a relief driver – had taken the E 300 Hybrid out from Tangier, Morocco to Goodwood in England, covering 1,968 km on a single tank of diesel. Deciding to present an Asean angle to it in a similar vein, MBM decided to take up that offer of a challenge, resulting in a 1,500 km-long drive last month to see if the car could make it from Kuala Lumpur to Bangkok on a single tank. Unlike the Africa-UK challenge, which was run non-stop to its destination, the KL-Bangkok one was done over three days, with around 500 km covered in each day’s run – MBM ran six cars for the drive (three Malaysian teams and three Thai teams of two drivers each), which had a planned route of 1,509 km. All the cars ran air-conditioning (though to varying degrees, quite literally), and there was plenty of urban mileage in the mix. 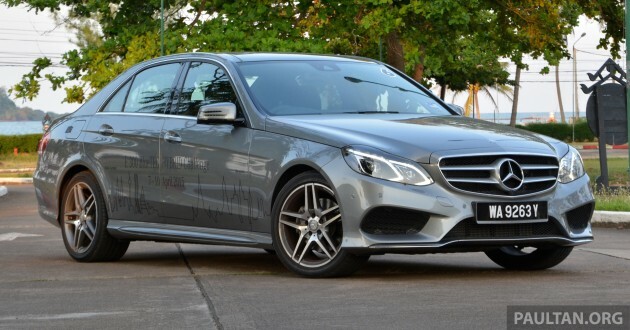 Before we get to how it all panned out, a quick recap of the culprit in crime and the star of the show – the locally-assembled E 300 BlueTEC Hybrid was introduced into our market in January, and is the cheapest W212 E-Class model sold in the country, thanks to excise duty exemptions for CKD hybrids in place until the end of the year. When it was introduced, it was priced at RM348,888, but it’s even cheaper now post-GST, at RM338,888. As mentioned before, plenty of car for the price, with equipment levels identical to the range-topping E 400 Avantgarde. These include an AMG Sports package (AMG bodykit, velour floor mat, twin exhaust system with bumper-integrated rectangular stainless steel pipe ends) and similar 18-inch twin five-spoke alloys, wrapped with mixed 245/40 front and 265/35 rear tyres (brand-wise, Bridgestone, Continental or Pirelli, depending on your luck). Also to be found are AMG velour floor mats, an AMG Sport steering wheel, LED headlights and Intelligent Headlight Control Plus, a surround view camera as well as a rear seat entertainment system, which features two display monitors integrated into the front seat headrests. The car is powered by a 2.1 litre turbodiesel and electric motor combination – the OM651 DE 22 LA four-cylinder oil burner offers 201 hp at 4,200 rpm and 500 Nm from 1,600 to 1,800 rpm, while the three-phase AC internal rotor magneto electric motor offers 20 kW (27 hp) at 1,800 rpm and 250 Nm at an operating voltage of 120 volts, with power put to the wheels by a 7G-Tronic auto transmission. The electric motor, which is located in the clutch housing between the engine and the transmission to save space, is juiced by a lithium-ion battery housed within the engine bay. Always located on the passenger side, the unit sits right behind the front left suspension turret in our RHD car (and on the right side in LHD configurations). The standard 12V battery is housed in the rear boot. As its placement suggests, the unit is small (0.8 kWh energy content, 19 kW output), and as far as lithium packs go it’s not the final word in outright ability, but it’s still good to let the E 300 cover about a kilometre on electric power alone at speeds of up to 35 km/h, this on paper. In real world use there’s less usability than you might think, and in truth the hybridisation here serves more as an aid to improving the diesel mill’s performance and powering up the vehicle’s electrical system components. The battery – which is cooled by refrigerant similar to that of the air-conditioning system but via a separate circuit from the car’s AC – not only stores energy to work the electric motor, but is also connected to the 12-volt vehicle electrical system via the DC transformer to supply power to items such as the headlamps and comfort features. The E 300 is also equipped with an electrically-driven air-con compressor, which means that in stop-start traffic the AC system runs off the battery power, though as you’d expect that depletes power in even faster fashion. As for usable levels, the battery can power things until it drops to 36%, which is when the engine restarts and takes over. In electric-only mode, the unit is infinitely far less flexible than something larger and more complex such as that found on the C 350 e plug-in hybrid (which is expected). Primarily this has all to do with usable energy and the pack’s density – in short stop-start traffic conditions and crawling around carparks the electric-only route works well enough, but as mentioned earlier, the E 300 Hybrid should really be viewed as a diesel with some electric-operation assistance. Some notes about the battery’s performance – throughout the drive period the charged levels never got past 75%, primarily because of the way we were all driving, and the drop from a 60-65% level to the cutoff could be relatively quick, depending on the situation. Electric drive itself was a delicate affair – the motor felt comfortable enough moving the 1,770 kg mass from standstill and also while running the car in its ‘sailing’ mode, where the engine shuts down and the car is propelled along by the motor at speeds of up to 160 km/h. All this provided you’re light on the pedal – the limitations of dispensible power from the battery are quite evident if you aren’t. Which is easier said than done on roads providing plenty of load. Also, and this was evident as the miles wore on, once the battery levels dropped to around 40% and below EV operation became testy and less consistent to pedal input. On-paper performance figures for the car include a 0-100 km/h time of 7.1 seconds and a 242 km/h top speed as well as a rated fuel consumption of 4.1 litres/100 km. The nature of the drive meant we weren’t going to be checking out the former, but MBM had arranged for those on the challenge to try out the car beforehand to get familiar with its workings. As such, it was possible to get a better overview of the car in regular everyday conditions. Motor to engine transitions were quite seamless, though the diesel itself had a rough-ish underlying character. Power-wise, while the combined 590 Nm of torque may sound impressive, the reality is that the car didn’t feel all that fast off the line – it’s decent, but not 590 Nm fast. Driven in normal fashion in mixed traffic conditions over three days, the E 300 Hybrid returned a 5.9 litre per 100 km average reading off the car’s on-board computer. We were told that in order for the cars to make it to Bangkok adequately on the full 80 litre tank, we’d have to be doing nearer the five litres per 100 km mark. The term ‘when push comes to shove’ began to come to mind, and figuratively at that. On to the insanity then. The first day of the challenge takes us across the border into Hatyai on the longest run of the route, and co-driver Chris Aaron and I decide we aren’t going to suffer the enduring heat, running the AC at 22 degrees with the blower set to three the whole time. We pay for it – at the end of the day we’re last of the three Malaysian teams in terms of overall fuel consumption, but thankfully still under the 5.0 litre mark. The other Malaysians are obviously taking this one quite seriously, the best hitting 4.3 litres/100 km. They literally have to sweat for it though (AC 25 degrees, blower speed one) – at the height of the afternoon sun, it’s 42 degrees, and this when moving. The Thais, on the other hand, are having a blast. Past all the Malaysians, and always after every stop, as if fuel consumption is the last thing on their minds. They look a lot less frazzled than us at each of the intermediate break points – something to do with plenty of air-conditioning. The MBM crew murmur that at this rate the Thai cars might not make it all the way, but they’re still mainly in the high fives, which isn’t bad considering they’ve been barreling along. Comfortably, I might add. Day two takes us from Hatyai to Chumpon, and by the end of that session our car is neck-and-neck with the second-placed Malaysian team from the day before. Having tweaked our AC temperature up to 25, blower still at three, Chris and I bring our car’s overall average down to 4.7 litres/100 km over 1,007 km, and our average for the day has dropped to 4.4 litres. The effects of all the toiling are beginning to set in though, and for everyone. It’s not like we’re crawling – everyone has come to the opinion that 90 km/h is the sweet spot, and our average speeds are actually very decent. But we’re groaning when we see upward inclines, happy on level ground and rejoicing on the downhill stretches, when we can set the car to its ‘sailing’ mode. We start trying out new and rather inventive ways to keep the car running on electric power alone – we irritate Thai drivers by leaving traffic lights in EV mode, crawling as far as we can at the slowest possible take-up speed; there’s even the ‘secret pounce’, a move my co-driver comes up with and involves stopping an extra length behind a car at the lights and letting the Benz creep the moment it turns green so as to get some extra purchase. Thai drivers must be saints, because no one honks at us despite our atrocious behaviour. It’s all bordering on dementia, but it’s paying off. By the end of day two it’s obvious most of the cars will comfortably make it to Bangkok on that single tank. We’re also getting very intimate with the car and its workings – that much time in it will always do that. The report on ride and seat comfort levels is thus highly positive, as is that of switchgear ergonomics and display legibility. Tyre noise is a bit on the high side going into the national speed limit, though marginal at the speeds we’re doing. Something to note about the battery – when ambient and direct in-bay temperatures get high it will disengage, even whilst cruising. It happened only once with the heat soaring outside (41 degrees), switching to engine-only mode even though a suitable level of power was available (66%). All efforts to coax it back by attempting to sail didn’t work, but the system switched itself back when the ambient temperature dropped. The final day’s run to the Metro Autohaus in Bangkok from Chumpon sees us two otherwise lead-footed drivers pulling out all the stops – there are Zen-like moments in which we treat the accelerator gently as if it were an egg, and by the very last stage I am caressing the pedal on with my socked foot like I’m making love to it, such has it become. The lead car is uncatchable in overall terms, but we score the win for the final day’s average with a 4.0 litres/100 km run, the best daily average achieved across the three days. In the end, our car finishes second with a 4.5 litres/100 km fuel consumption, achieved over a distance of 1,477 km and nearly 22 and a half hours of driving time at an average speed of 66 km/h. The third-placed Malaysian car also ends up getting a 4.5 litres/100 km reading, but is just shaded on available distance left. The winning car – driven by Jay Wong of The Star and Arvinda Kumar of CAR Malaysia – manages 4.3 litres/100 km over a distance of 1,486 km (strangely enough, none of the cars actually get past the 1,500 km mark), done in just over 23 hours at an average speed of 64 km/h. The trip computer on that one reads 476 km of travel left, which prompts one of our lot to say, “Hey, we could actually have tried to make it to Chiang Mai.” I’m glad there are no sharp objects within my reach at that point. Great read ! I always love reading all the road trip articles here, and the earlier C-Class San Francisco one was top notch no less. One day… one day, I hope to make a similar road trip to Bangkok… or even Penang or Singapore for starts. This is going to sound embarrassing… but the only reason why I’ve not done it yet is because my parents won’t let me. Sigh. On a second note, the winning team’s Arvinda Kumar from Car Malaysia is actually my cousin ! :D He too mentioned that it was a quite the challenge, and that the Thai’s couldn’t be bothered. haha At the end of the day, it’s the experience that remains prominently in memory, so maybe the Thais had their point. However, it’s still morally unjust of them seeing how MBM has dutifully prepared the cars for everyone with genuine competition in mind. Yet the Thais were pretty much selfish and didn’t honour MBM’s honest intentions. The Thais didn’t do their job (as journalists), there’s no nice way of putting it. MBM will likely not invite these so-called ‘journalists’ next time around, might as well invite our Singaporean friends seeing that Mercedes is top dog there. I think the Thais drove as what the car will endure in everyday driving. I wonder what their “scores” were? How much fuel did they have left at the end? Do you havr the info, Anthony Lim? It would give a pretty good indication of what it would be like to maintain this car. YP, I didn’t obtain the provisional results for the Thai cars at the end. I know one of their cars was quite close to our figures (under five litres), and based on calculations believe the other two would have been reading low to nearly mid five litres, especially in the case of the car running on empty. I reckon that in a daily urban driving routine the Benz can return a realistic 6.5 litres per 100 km, if you’re not heavy-footed about it. Our camry hybrid also can achieve that fuel efficiency, but our camry hybrid may not able to achieve 1500km with a full tank simply because our Camry Hybrid has SMALLER tank! But at the other side, with W212 price tag, you can get 2 Camry hybrid already. Which is more money saving? Still cannot reach that figure, because Camry isn’t a diesel. Few years back, If not mistaken TOP Gear Malaysia did a Fuel Efficiency test on Lexus CT200H against VW Passat. Test route begin from Singapore all the way Bukit Kayu Hitam and then back to Singapre. Lexus managed about 1300km+ with average 50 km/h air-cond off. Passat on the other hand managed 1500km+ with average of 90 km/h also with air-cond off. Of course Lexus fuel tank is only 45l vs Passat’s 70l. In this test, Lexus won the most fuel efficiency but Passat won most km traveled per full tank with much shorter period to reach destination. Conclusion: Hybrid cars best efficiency is on town area where it is operating within EV mode only. On the highway unless u drive in full EV mode only, not much difference with other regular cars when traveling at higher speeds. The thai journalists were trying to do real world driving for the benefit of the public. Driving extra frugal is pointless to potential buyers. Nothing beats Camry Hybrid in fuel economy. Not even this Merz can. Trust me! No. Last week I did a similar test on Camry Hybrid and drive it around KL. So, thanks to diesel efficiency, Merc E300 wins. Hands down. Sam lorrr. Dear friend, Mercedes is far more superior than toyota larr. Different class of car. Go to bangkok bro, toyota camry hybrid used as taxis. LOL. E-class as well is germany but again different class of car. Thats why so freaking expensive!! Its been quite awhile since paultan had an entertaining piece like this, hahaha! Intentionally leaving a space to give you time to start the ‘creep’ was brilliant. Wonder if its usable with a decent speed. Hmmm. say “hey, we could actually have tried to make it to Chiang Mai.” I’m glad there are no sharp objects within my reach at that point. Camry hybrid can smoke this car easily. A very expensive way to save fuel. Hmmm, good thing doesn’t come cheap. I think the E class is the oldest and ugliest car in the entire mercedes line up. Mercedes really needs to update it fast. @ben. What car are u driving? Camry 2.5V. Way more class than merc. You must be dreaming too much while you are driving your saga. please launch euro 5 in K.L ASAP Mr.Goverment…. No good diesel = no V-class; people just have to settle down to or settle for Alphard UMW. Hypermiling is a form of torture. Average speed of 64km/h with 4.4 litres of fuel per 100km, Seriously? I can do better in my Mirage. The reason why the Benz could made it there is because of its large fuel tank. Would be interesting to see how the Audi A6 2.0 Hybrid would perform. Who is thw journalist that said the engine 3.0 litre turbo engine where in the writing stated 2.1 litre engine. Which one is true? You drove the car for three days and cant even get the fact right? Puuiiii journalist. Which part in this article said it was a 3 litre. You get your facts right before commenting. Watch the video and listen carefully. Go watch the video.. To be precise on 3:38. Confuse, the OM651 engine in the car is a 2.1 litre (precisely, 2,143 cc) four-cylinder turbodiesel. The DE 22 LA variation powers a host of Mercs, including a number of W205 C-Class models (in different output states of tune on the C220 and C 250 BlueTEC – there’s also a C 300 BlueTEC Hybrid, essentially the smaller version of the E 300 BT H here). It’s not a 3.0 litre. If they can make it from country of kia su to Tomyam land capital, that will be Amazing! Very good article. I do a bit of mild hypermiling too, like letting the car creep when initially moving from standstill rather than using the throttle to move (but of course, eventually have to step on the throttle unless you want the guy behind to give you some finger signals). Of course, this will not work if you use a dual clutch transmission, as they don’t creep (except Acura’s as their dual clutch uses torque converter at low speeds). Also planning ahead when to go off throttle (and coast) when you see traffic ahead slowing down – like the writer’s team mate did. But to do all that for 1,500k km, thats pretty hard work and requires mental strength, especially if you are a car enthusiast (and with 600NM of torque at your disposal). I’d probably have gone mental after driving slowly for 500km. Then spend the next 1000km going really quickly. so for those who do have one, how is the maintenance cost like? I now for a fact that maintenance for the E200 isn’t cheap in comparison to BMW, during the scheduled service. The battery cost RM50,000! You better pray that it doesn’t die after the 4th year. 4 yrs warranty for the car is fine but I would prefer at least 7 yrs for the battery. On a separate note…RM338k is not really that cheap….if you compare to the A6 Hybrid. The E300 is CKD, diesel and does not come with adaptive suspension. The A6 was very well speced and it was only about RM285K and CBU. Actually you do raise an interesting point on the battery cost, which again, remains interesting cause of the placement of the battery in the engine bay may not be a good idea especially in terms of heat. good point on the battery, the batt on my A4 lasted 5 years and it was located at the back. One more thing, the E class is due for a change soon….Merc is already doing initial testing the mule. @blaster. What car are you driving? Im not that impress with the results.the reason why is, the car should be judged on km per litre, not how far the car can go.This Benz can go so far, simply because the fuel tank is big(80litre). we can see this e300 able to achieve 4.3 per 100km(23km/l),quite good, but at average speed of 60plus km/h..come on Paultan, so unrealistic speed. Prius easily top the mileage with faster speed. I thought the test must be simulate the real driving experience, It should be driven at least 90km/h. For long distance journey, I dont think that people will drive only 60plus km.hahaha. btw, e300 not really efficient if we need to drive it like turtle. I thought that mileage can be achieve at highway speed(110km/h)..seems like Im wrong. This rubbish sui kwan euro is no match for my prius. 2500km per tank easily. I can drive all the way to Mongolia. Haiyo, 2500km is like childs play only compared to what my car can do. I can easily achieve 10000km without using a single drop of fuel. Ask someone sit in the driver seat and another person push the car from behind with the car engine off n in neutral gear. Estimated to reach France in about 10 years time. Top Gear Malaysia has proven Lexus CT200H can manage 1300km+. I think you probably push the car for the balance 1200km when you ran out of fuel. If you think this is fuel efficient. You haven’t seen what a camry hybrid can do. Can do what? Crampy boot overpriced car! What de f@#% wanna save fuel for since its f@#%ing expensive and not affordable by most users! Dont waste ppl time! If the owner cannot afford to replace the Rm50k battery, can it just disable it and run solely as diesel car? Yeah silly question but just askin’. And how about doing the same test for Audi A6 hybrid or BMW 5 series hybrid for more comparison? Then extend it to other hybrid cars. Compile it all in one big table as the ultimate hybrid cars buying guide. At current rate, diesel-electric hybrid seems to be the best combo? Time will tell. Wow,nice car,good fuel comsumption.Good job Mercedes.And too Same Lorrr,are you sure your Holy Vios and Camry can beat this car?I am a Proton fan also said that this car is better than my Suprima S.About 10 percent better.Pity Same Lorrr. Ford Focus TDCi had similar experiment…around malaysia in one full tank. I bought one. Yes, the claims are true….but (a BIG but), this is provided u drive consistently at low speed with minimal breaking and turn off the aircon. Realistically speaking, no one is going to do this on a day to day basis…so its really pointless. However, it is still a lot more fuel efficient as compared to an equivalent petrol car. I decided enjoy the power of the diesel engine instead! You end up drive a lorry? People who buy this car will have company ‘Ah Kong’ petrol. Frankly, Diesel provide more torque and better mileage. However, our Euro2m diesel might damage ur modern diesel engine even it is “tuned” to malaysia diesel grade. Toyota/lexus hybrid system is well known and proof the best gasoline efficient system. We should not compare this system to Diesel. MBM E300 bluetec hybrid is diesel engine with massive tank. I would said both are efficient car. depends your budget and acceptance of malaysia diesel grade. Efficient, value for money, get the toyota hybrid. thats about 22km per litre … a toyota prius C can go for about 19km per litre (actual driving experience!) at less than 1/3 the price of a mercedes benz. of course the car is smaller and everything, but honestly i think ppl who buy mercedes isn’t that concerned about fuel consumption. Anthony you should have brought me with you. I can do 3.7l/100km on Vw golf petrol engine, certified officially by Vw. Surely can do better with the diesel engine car and help you to be champion team in this competition. Having read your Teana v Camry v Accord most informative test I was somewhat disappointed that this test was more about economy than the actual car. I have had horrendous problems with my MB E300 Hybrid AMG, 4 weeks off the road and then the auxiliary battery had to be replaced for the 2nd time. Some points about this car – NOT leather interior which is plain misleading, mega hesitation when you want immediate acceleration to overtake, stupid drive and reverse control on the a stalk on the right of the steering wheel – you know just where the Japs (I also have a Hilux) put the indicator stalk – which can translate into knocking it into REVERSE when turning right. MB will no longer even answer my e mails. I like its looks though!